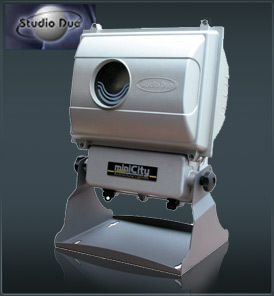 The Studio Due MiniCity 150sl is a CYM flood projector which has been created for static architectural purpose but, however, it is extremely versatile and can be used also for traditional applications.The optic system, covered by patent, uses of a simple but afficient CYM colorchanger with dichroic filters and allows a progressive and gradual colouring of the entire light beam, which can therefore continously reach endless shades and colour saturations. The spot, very small and compact, can be directly installed to the ground or on a wall like common white beam projectors. The high protection against dust and liquid is very high, IP 55, and guarantees the perfect functioning also in unfavourable weather conditions. The lamp is manufatcured with UV-block technique, which stops the ultra-violet rays by making this lamp one of the safest and mostly appreciated ones for indoor lighting or commercial areas. It is therefore useless to point out that with a price that is slightly more expensive than a PAR one has the possibility to use an intelligent and potentially superior colorchanger. For particular purposes, when for example a more narrow and powerful light beam is necessary, the fixture can be equipped with an HTI 152W lamp. The already stored programmes can make the Studio Due MiniCity 150sl work, singularly or synchronised with other fixtures, also without DMX control: the user can obtain the required scenery by choosing the proper stored programme. The use of our DMX recorder EASY CONTROl can be very helpful because it allows to store a serie of programmes that can be designed on purpose for any specific application. For professional uses such as special events, stages or theatres the Studio Due MiniCity 150sl can be driven in DMX and all its potentialities will be better exploited.